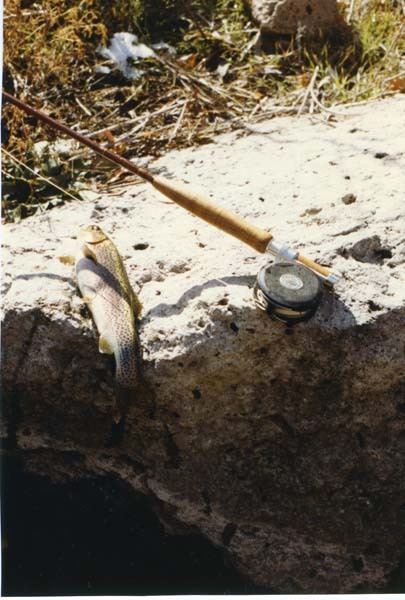 from a May 1982 trip. 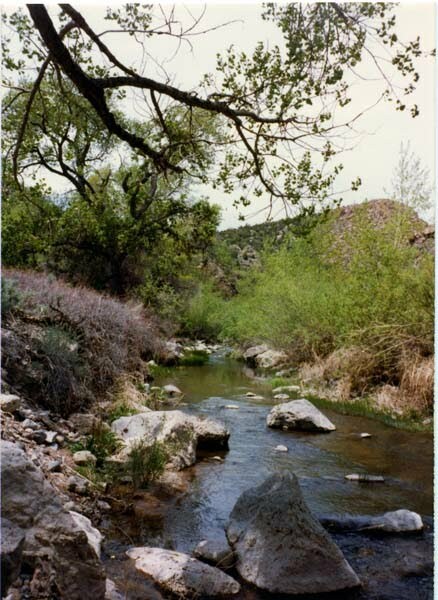 The view looking upstream from wilderness campground, 1982. 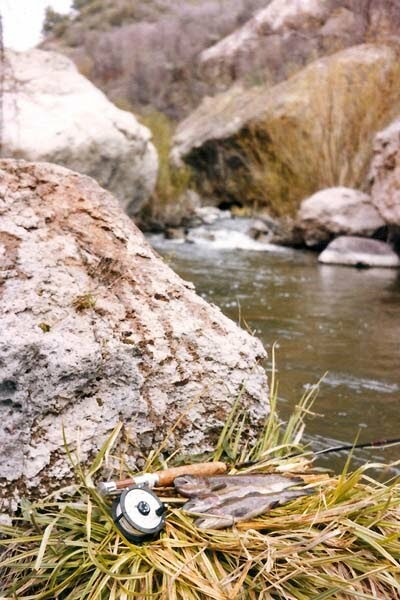 An upstream view near the wilderness campground, 1982.
remarkable trout from Beaver Dam Creek. 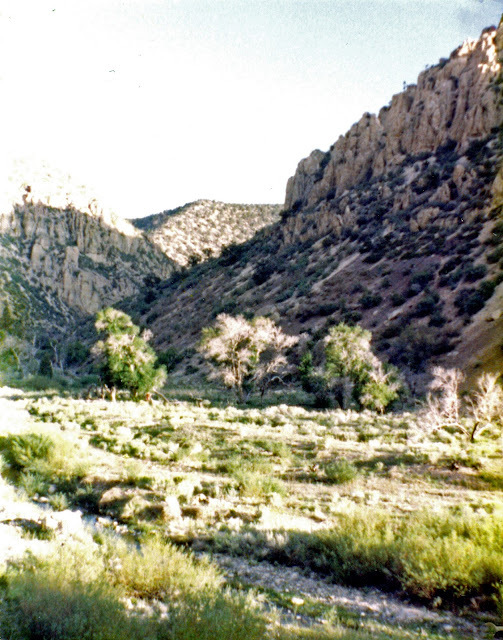 Kevin and I trekked up the canyon to the Utah border in the spring of 1977. 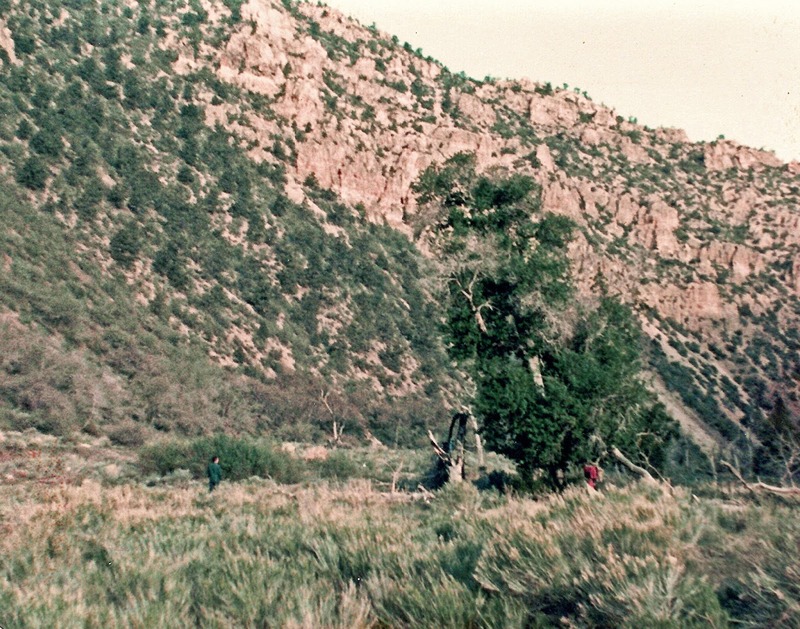 Kevin McGoohan standing among the sage on the left side of the photo. 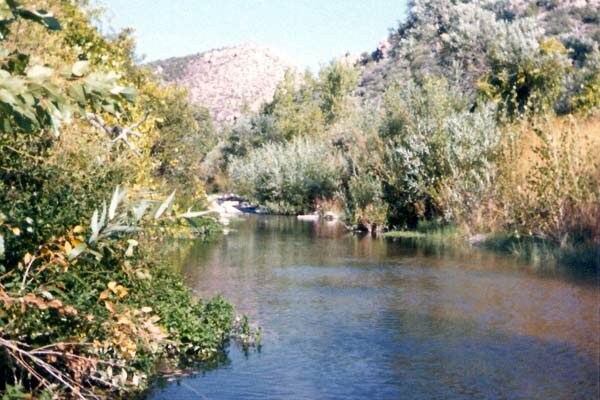 Ranch) joins Beaver Dam Creek. We were backpacking upstream to the Utah border in the spring of 1981.
from my May 1982 trip. 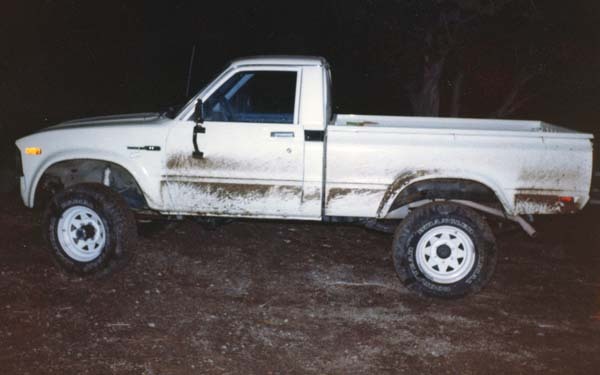 was deeper than the 30 x 9.50 R15 tires. spillway pool in October 1982. 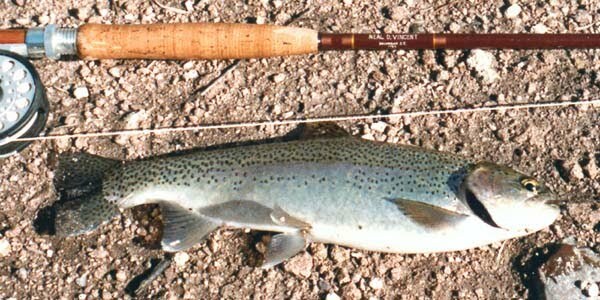 It was the largest trout I had caught from the creek. 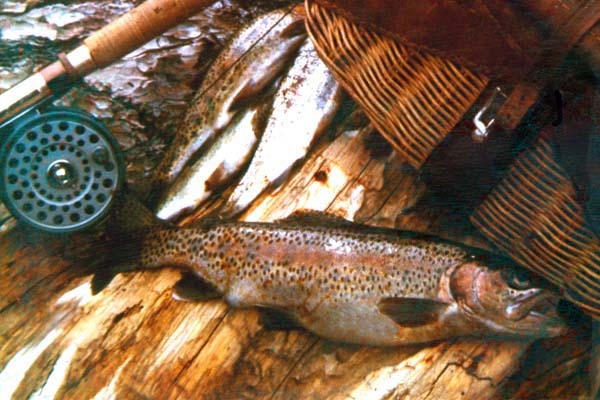 A fine trio of beautiful trout taken from the "honey hole" in May 1982. 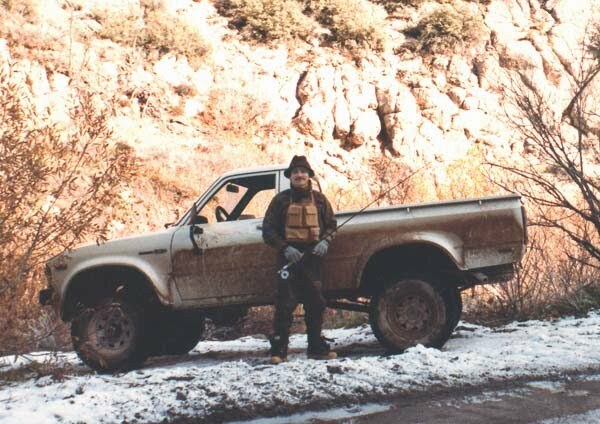 Young FisherDad ready to field test Neal's Christmas present, October 1982. 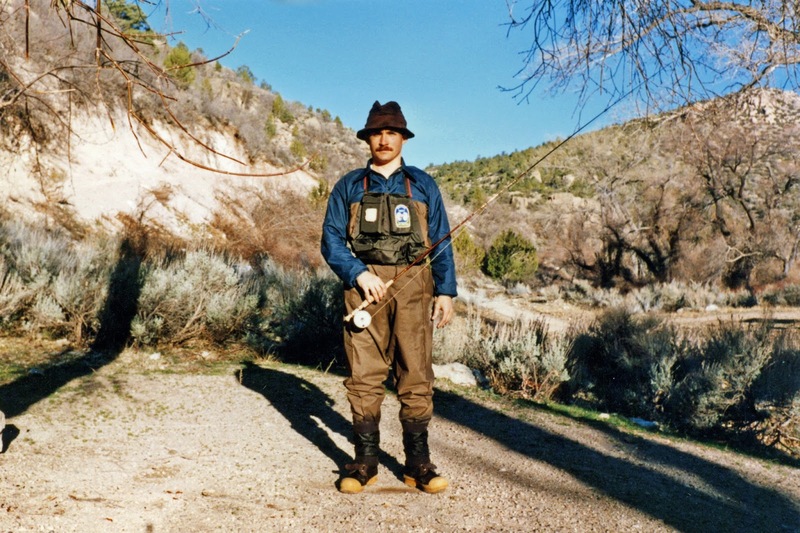 I still enjoy fishing Beaver Dam, but it’s not the same for some reason. 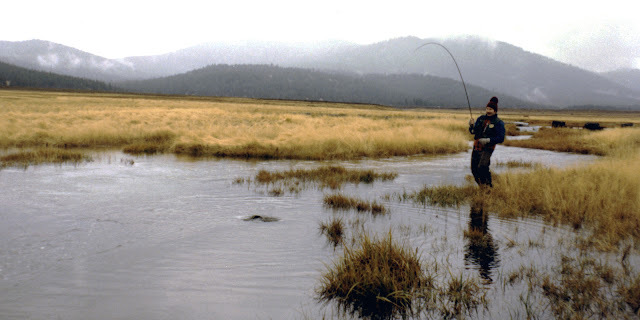 Maybe it is because I am older and less limber, a critical factor for stealthy, crouching approaches to these skittish, wild trout. 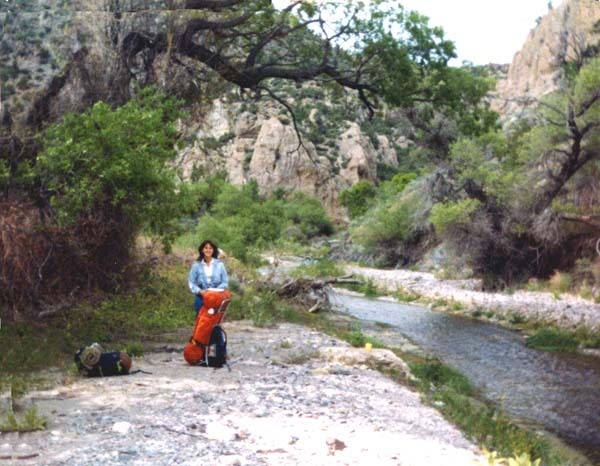 In fact, in August 2002 I snapped back my ring finger after slipping off a rock (well, I had to save my little six-foot rod so I held that high in my right hand while bracing for the fall with my left). I dislocated my left-hand ring finger, but was able to snap it back into place. For a while I had to wear my wedding ring on my right hand… it wouldn’t fit on my left hand. was the fateful "ring finger" trip. 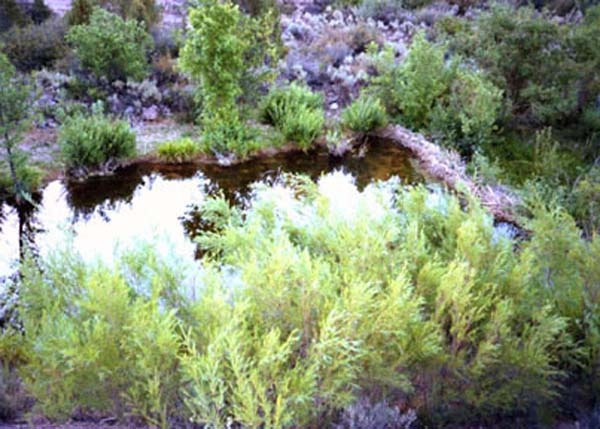 One of the numerous beaver ponds found on the creek in the spring of 2001. 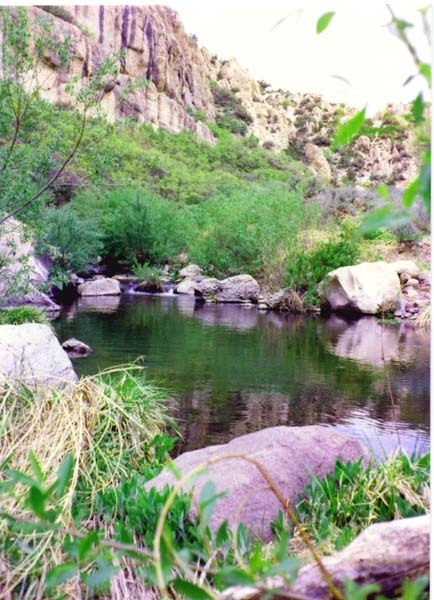 A pretty pool, just below the spillway pool which is around the bend to the right. 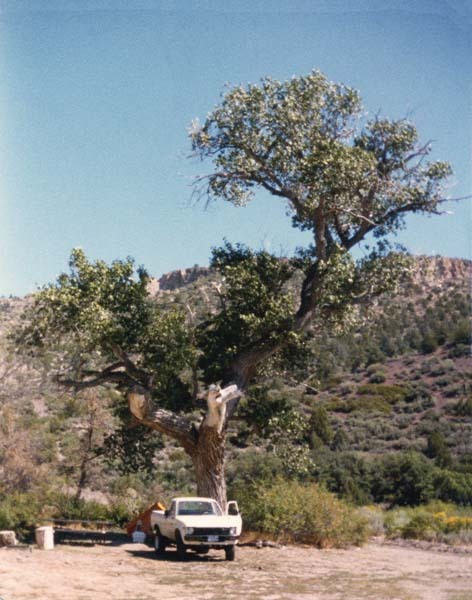 Photo taken in May 1982. 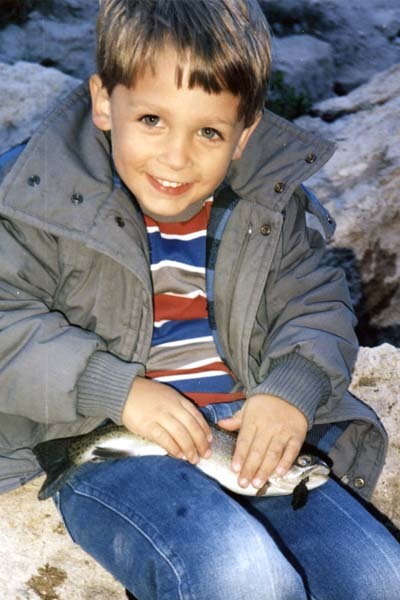 My son Doug with a Beaver Dam Creek rainbow on his lap, circa 1992. 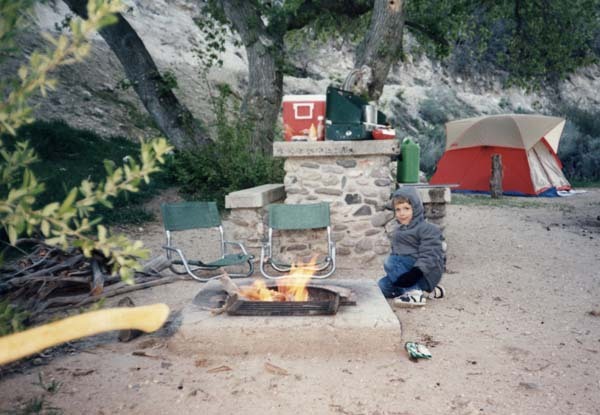 Our wilderness camp, circa 1992. 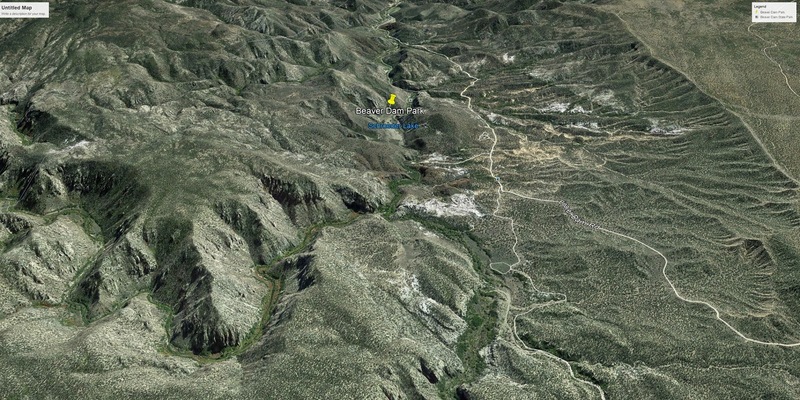 Here is a Google Earth image looking into Beaver Dam State park from the north; looking downstream as it were. The blue "Schroeder Lake" label is the site of the old reservoir that was removed in 2005 for safety reasons. The winding canyon on the left side of the picture is Pine Park Canyon from whence the creek originates. Denise. 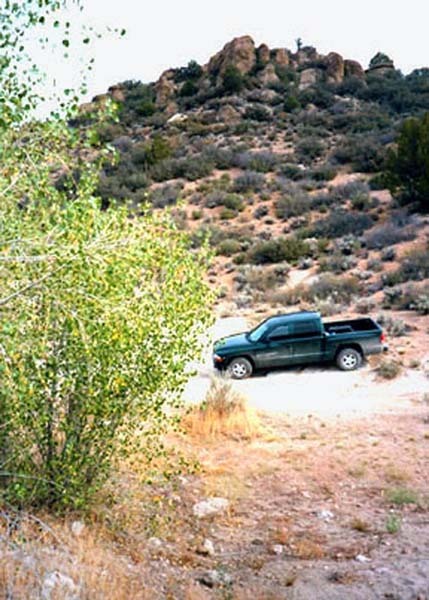 There is a faint line running diagonally just to the left of that bowl which marks the Utah/Nevada border. 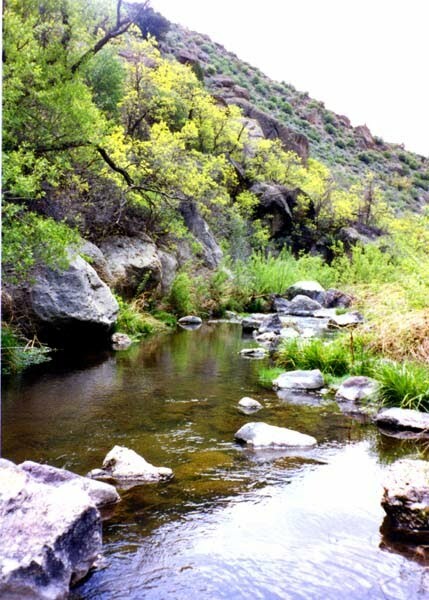 from the creek in the early mornings and late afternoons. 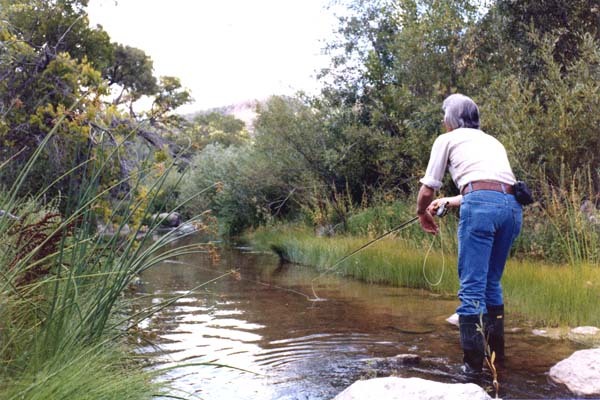 It was a marvelous place to learn fly fishing.